Bizon floor liners are constructed from elastomeric material that allows these floor mats to remain malleable without breaking, cracking, or curling. This uniquely formulated TPO material allows Bizon floor mats to repel chemicals such as gas, oil, and even battery acid! 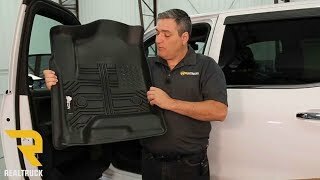 Laser scanning allows Bizon to create floor liners that will match all the nooks and crannies that are specific to your truck's floor. Designed with nibs on the back side of each floor mat ensures that they will retain their placement and guarantee no shifting. These mats also have raised edges, so you can be sure any spillages will remain in the mat and off your carpet! Backed by a limited lifetime warranty, Bizon floor liners are made in the USA assuring quality you can count on. Installation of these liners is simple and will come with clear cut instructions. If there's any special details needed to be noted, Bizon will have it called out in the instructions. So, if you're looking for a heavy duty, every-day battling mat that still looks good while doing it, do yourself a favor and buy a set of Bizon floor liners today! Floor liners & mats from Bizon come backed by a limited lifetime warranty that covers defects in materials or workmanship. Please give us a call if you have any questions or if you need help filing a warranty claim. 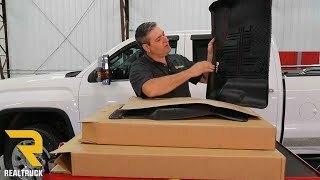 Bizon floor mats & liners offer an easy installation. Any special instructions are detailed in the instructions that will arrive with your floor mats. This installation manual is very easy to understand and follow along. If you have any questions regarding your new floor liners, or if you would just like some additional information, please don't hesitate to call us any day of the week.